Health Information Technology Solutions are necessary. The healthcare industry faces diverse technological problems. Data security problems are always changing and mutating, non-standardized data formats and data quality issues cause delays and confusion, and navigating complex data systems can be prohibitively time consuming for healthcare workers. Technological problems such as these are negatively impacting the care patients receive and can cause distress for healthcare providers and system administrators. Information technology offers a myriad of opportunities for improvements in healthcare delivery. Our teams help select, design, develop, implement, and manage health information technology (HIT) services to improve outcomes. We can help you work smarter, with flexible and agile health IT solutions, to better manage your mission-critical processes. Your data will be secure (HIPAA Compliant) and still be quickly accessible, allowing for responsive data-driven decision making. When you need help deploying and managing HIT infrastructure, developing Electronic Health Record (EHR) systems, managing HIT/HIPAA compliant hosting, or providing IT support to clinical and health administration organizations, Call us: 877-252-6447 (ext. 121). SISOnline – Formed a partnership to develop, host, and support Clients using web-based disability assessment tools for over 30 states. CAREWare Hosting – Hosting and operations support for this electronic health record system for HIV/AIDS clinics. EHR System Development (Alcestis) – Partnership to develop and host a web-based medical examiner and coroner records system. Health Services Systems (dSIS) – Partnership to develop and host a web-based benefits application and health records system. 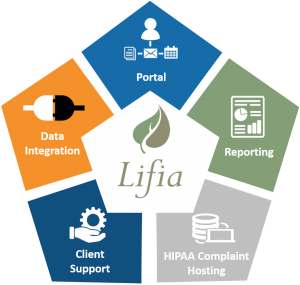 Lifia Portal – Hosted and created a Case Management, Eligibility Determination Solution. Managed Healthcare Infrastructure Services – Managed Hosting, Email, and HL7 Interfaces.